Donoussa do not offer many beaches, but those who are keep high quality and are child-friendly. Some are difficult to access, but most people choose the pleasant port beach or head for the nearby Kedros beach. Nudism is common on all beaches, except at the port beach. The port beach in Stavros. 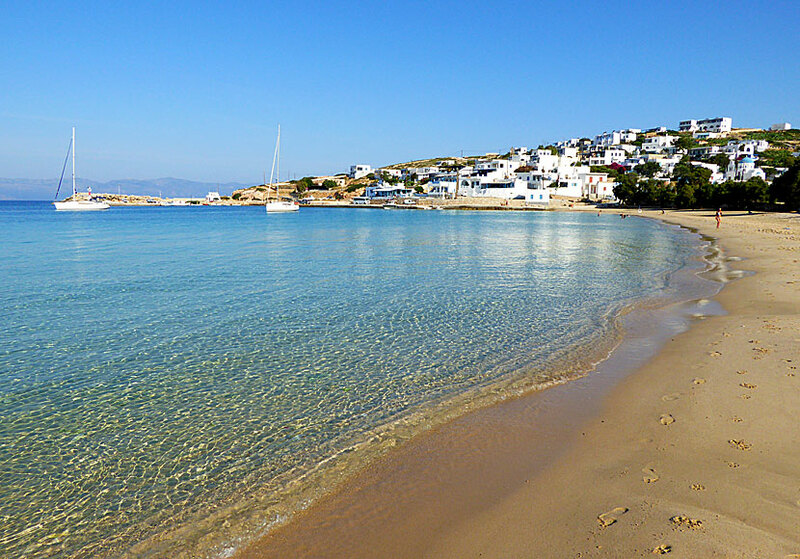 The port beach of Stavros belongs to the island's better and is popular among families with children since it is close to home and close to tavernas. Actually, it would have been enough with the port beach, because it is quite long, just like the port beach of Koufonissi. 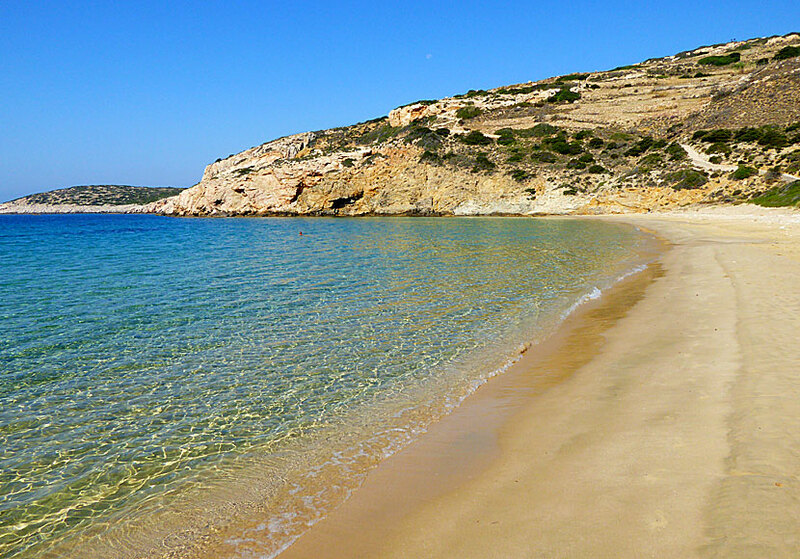 Kedros beach, east of Stavros, could be Donoussa's best beach, it takes between 15 and 20 minutes to reach it on foot. The beach lies in a sheltered beautiful bay, the sand is fine-grained and the water is clear and clean. Difficult to find shade. Taverna is available. Kedros beach has become popular among free campers in recent years. The beach is full of people living in small tents or self-built reed houses during high season. The island of Anafi was the free campers' paradise before, but now Donoussa seems to have taken over that role. In an inlet just after Kedros is a tiny beach that is difficult to access and it is usually empty of people. An old worn windmill stands above the beach and looks lonely. From the windmill you have fabulous views over the sea. A beautiful and tranquil place to have picnic. Livadia beach lies further east and can be reached by beach boat in high season. It is possible to walk down to Livadia as well. The path begins in Mersini which you can reach by bus from Stavros. There are no tavernas on the beach, but there are two in Mersini. A few tamarisk trees afford shade. 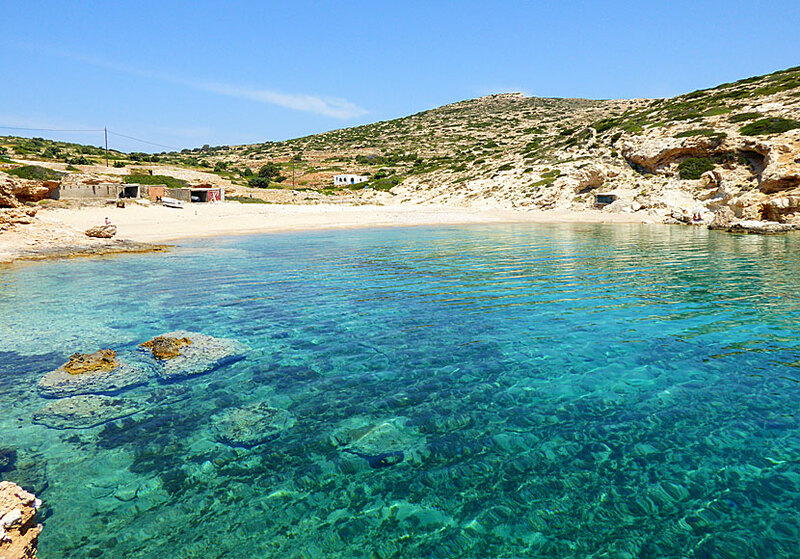 There are three good quality beaches at Kalotaritissa in the northern parts of Donoussa. Kalotaritissa is reached by bus from Stavros. Taverna is available. Sun beds and umbrellas are not available for rent on any of the beaches. 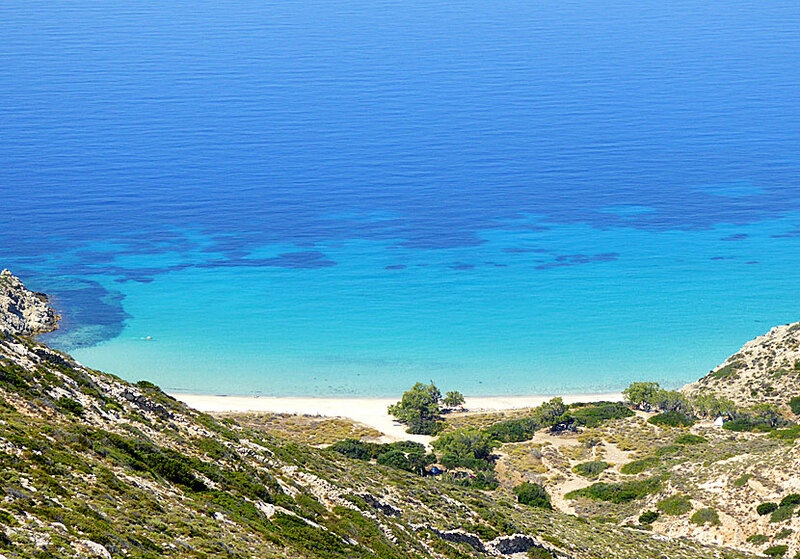 One of the beaches in Kalotaritissa.